I must say that for me personally, like probably the majority of players, it would be advantageous if the title is held as a knock-out, just because then I am more likely to become world champion. 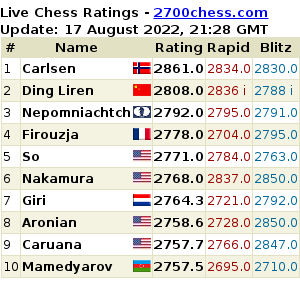 But these things need to be looked at more broadly, considering primarily the interests and future of chess. Firstly, the Americans have a very sensible saying that I have somehow voiced in an interview with Chess-News: if it ain't broke, don't fix it. For me it is obvious that at the moment the world championship match is the only chess event which attracts a huge number of people, even those who have little interest in our game. This is the only chess event, which gets covered in the leading non-chess world media. Finally, it is the only chess event, to which sponsors are ready to allocate seven-figure sums. While this is the case, to abandon the event, in my opinion, is absurd. Secondly, for many, chess is associated with the world champions and with matches for the crown. Maybe with the younger generation it is not so, but nevertheless. There are so many people who are completely unaware of any knockouts, had never heard the names of their winners. At the same time, they know everything about the names Fischer, Tal, Karpov, Kasparov (the list goes on) and their battles for the title. If you like, the title of champion of the world is our brand. Not so long ago I read someone who said that the title of world chess champion is the weightiest world title in all sports. I thought about this and realized that this is true. In the minds of people the world chess champion is more than just a world champion. And that is what helps chess to become more popular. But a knockout world championships does not bring a tenth of spectator interest, as has already been proved in practice. And, most importantly, it devalues the title and this will cause irreparable damage to our brand. I do not exclude that in ten or twenty years, interest in matches may be lost - that's when there will be problems, and then we must think to change something. By the way, if we look at the history of the sport, changes always occur when there are problems. Reduced audience attention, loss of interest on the part of sponsors and so on. If you want, this is pure arithmetic. But we see that in chess right now it is not the case. Interest in general is increasing, we are getting bigger tournaments, children are playing, there is interest in the match for the world championship, a huge prize pool, etc. It is all wonderful. The argument that the knockout is "democratic" has been heard many times, but it is easy to understand that it is not. In the existing system, everyone has a chance to become a champion. There are just a few more selection stages. The only difference is that it is easier for a player who lacks true world championship class to become world champion via a knockout, and that, in my opinion, is wrong. I can give you a few more reasons not to agree with Magnus' proposal, but I think this is enough. In chess, nowadays you can find a lot that needs to change. For example, I wonder why very few players are really concerned about cheating. I believe that this is a very serious problem, and we must concentrate on its resolution. This issue will not go away, will only get worse, and the sooner we deal with it, the better will be the result. But the world championship match is one of the few things that does not require changes. This is what actually keeps chess at a high level in terms of respect for people and a positive image. Submitted by Mark Watkins on 13 August, 2015 - 02:12. I must say that I largely agree with Kramnik's opinion, that "fixing" the World Championship is not something which should be a priority for FIDE. As noted, the difficulties of the KO format include the luck factor, and questions of saleability (even if the champion is seeded into say the quarterfinals). Look at the Anand-Gelfand WC compared to the contemporaenous Kramnik-Aronian match, which had the 7-figure payday? Which had the publicity, both inside the chess world and out? The "branding" is exactly why FIDE cherishes the WC as it is. Having a "World Championship" without the reigining champion as a focal point is simply foreign to chess, at least as it stands today. 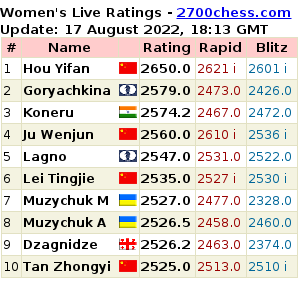 The round-robin in Mexico 2007 is another example, although FIDE called it the "World Championship", some saw this event as more akin to the Candidates, given the "rematch" clause that Kramnik held if he did not win. The subsequent Anand-Kramnik match generated much more publicity (as Kramnik put it, "for me it is obvious"), and for many fans this was more of a "true" championship. Submitted by Mark Watkins on 13 August, 2015 - 02:29. Concerning the luck factor in KOs, with the current World Cup format some of this is merely because it is 7 segments in just 25 days, a quite contracted schedule. For the sake of argument, if FIDE were to divide the KO format into, say, 8 "regional" KO events, each 3 weeks in length, and then have the 8 winners meet in the "World Cup Finals", this being a prestige event again 3-4 weeks in length, perhaps there could be 4-game matches at the start and 6 or 8 games at the end. Undoubtedly luck (and tiebreakers) would still play some role of course. Whether such a system with "regional" qualifiers would be viable is not clear to me, and anyway, Kirsan's FIDE has always preferred the big confab ("the stage of the world" as it were). "It will make the title more accessible for all"
Alexei Shirov talked about the current system of the World Championship matches in the interview given to the newspaper Sport Weekend. Sergey Karjakin stands out the majority of GMs, who according to Emil Sutovsky are against of embedding the new title - supergrandmaster. Anatoly Karpov About FIDE Management: "Thanks to Them, We Have Lost at Least Twenty Years in the Development of Chess"
Anatoly Karpov believes that sportive chess is experiencing a crisis. The author was planning to write right after Anand - Carlsen match finished in Chennai. But I never got to the thing. Then I thought that Candidates' would be a new reason to get back to the topic, but its outcome again made me to put away the subject.